I was saving this post for today and accidentally published it- back in time- in Oct. So sorry if you are seeing it twice. I’ve got a baby on my lap and it’s toying with my brain. I love having him here though! I’m so lucky to have the fabulous Kate Miss guest posting for me here on Maquette. Her aesthetic is so enviable. Now I want all of these things for my new baby! Welcome Kate. Hi, I’m Kate from For Me, For You! In honor of Samantha’s little one, I thought I’d use my guest post to highlight some of my favorite baby things I’ve come across that I love. I am in no way an expert in this area, having no kids and no plans for them for a while, but like a lot of girls I swoon over all things pint-sized and store cute things in my head for the future. I love Kate’s taste in stuff- and this baby stuff is no exception. Great post! 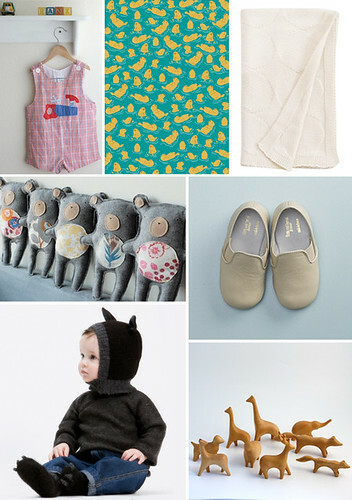 i am inspired to have kids just to have an excuse to buy all this cute stuff!!! I have a little baby now and believe me…I want it all too! Adorable yes indeed. Kate has impeccable taste!